First of all, Add Pay Balance in Amazon Wallet. Go to the new Amazon Mobile Recharge Page by Clicking Here. Enter your Mobile Number, Operator + Circle. Make payment using your Pay Balance to get 100% cashback. Go to Amazon Jio offer page by Clicking Here. Enter your Jio number and choose a plan. Complete recharge. You will get cashback within 7 days. You need to pay only using Amazon Pay Balance. 100% cashback offer is valid only for first order till 30th August 2017. Get 20% cashback by paying with Pay Balance on your subsequent recharges. This Amazon recharge offer is valid till 30th November 2017. Maximum cashback per user is Rs 300. 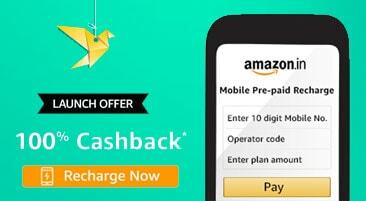 Amazon recharge takes a little bit extra time but cashback offers are great.